Ethiopia’s Crisis: What is Causing the Political Turmoil and Ethnic Tension? Political turmoil and ethnic tension have continued to engulf Ethiopia. Begun in 2015, the protest has swept the nation and is getting stronger, pushing the country to the brink of ethnic conflict. Ethiopia has been under a state of emergency for much of the past two years. The first state of emergency was imposed in October 2016 following a year of protests and was lifted at the end of 2017. The second one came on February 17, this year after the resignation of Prime Minister Hailemariam Desalegn. 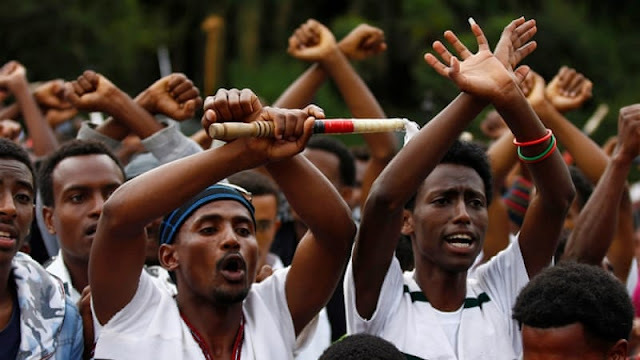 According to HRW, in 2015 alone thousands were killed and tens of thousands of protesters were detained in Oromia and the Amhara regions in connection to the protest. “Many of those who were released reported that they were tortured in detention, a long-standing problem in Ethiopia,” said the Human Rights Watch. Since Ethiopia’s government declared the new state of emergency this year, the security forces have killed dozens of people and have been criticized for failing to investigate the killings. The number of those killed since January are estimated to be more than 20 and most of them are members of the Amhara and Oromo ethnic groups, according to media reports. This has raised a concern that the situation may turn into an ethnic conflict which may end up leading the nation into a blood bath. Although the protest is spreading throughout the nation and is shaking the foundation of the regime, authorities are not showing willingness to institute political reform. This has alarmed the international community and is forcing it to take action against the regime. Concerned, the United Nations has recently called on the authorities to refrain from using force while the US congress has drafted a new bill which targets the regime. However, in spite of all this, the regime has intensified its violation of human rights, targeting Amhara and Oromo ethnic groups and their descendants, according to Minority Rights Group International. “Human rights violations against the Amhara and Oromo people are happening against a backdrop of a highly restrictive environment. Civil society activists find difficulties to reach the worst hit places to access information, and risk arrest and persecution. Equally, journalists, bloggers and other social media users have faced harassment and intimidation. Such a restricted space is a hindrance for effective dialogue, reinforces persisting human rights violations and delays justice for victims. Yet the Ethiopia government remains adamant on what is happening, and has ignored calls from the international community to constitute an independent inquiry into the use of excessive force by the security agents to quell protests.” the institution said. This nationwide protests first began in 2015 and were sparked by the government’s “city expansion plan,” which allegedly threatened the livelihoods of ethnic Oromo framers in the area. Although the government claimed that the plan benefits Oromo farmers, experts and residents opposed the plan, saying that it was part of the land-grabbing scheme of the Tigryan people. Despite the fact that the plan was an immediate cause, at the heart of the issue is a resentment of those ethnic groups who feel that they have been marginalized. What is behind the turmoil? To understand Ethiopia’s present-day turmoil, it’s key to look at two factors which are at the center of the resentment and are fueling the country’s implosion. Ethiopia is the second most populous nation in Africa next to Nigeria and is home for more than 80 ethnic groups. There are also important linguistic differences among the population. Ethiopia’s constitution reorganizes the importance of the political participation of all ethnic groups in the country and guarantees their rights, which extend to self-determination. Yet the practice is completely different and contradicts the constitution and violates the rights of these ethnic groups. The country’s politics is dominated by Tigrayans, who are approximately 6 percent of the population, and others are marginalized. Although the country follows an ethnically-based federal government system, the individual states are powerless and the parties which represent each state and ethnic group in the ruling coalition, Ethiopian People Democratic From (EPRDF), are no more than puppets. The dominant party, the Tigrayan People’s Liberation Front (TPLF), which represents the people of Tigray, came to power in 1991. The party’s first goal was to build “the greatest Tigray” while it was fighting with the communist regime known as Dereg, which ruled Ethiopia from 1974 to 1987. However, after the downfall of Dere, TPLF changed its program and orchestrated the creation of these political parties which represent their respective ethnic groups, and it then formed the coalition, EPRDF, now a tool used by the TPLF to legitimize its power and to exercise absolute control over most aspects of people’s lives: society, the government, and the military. The federal system in Ethiopia came into effect in 1994 and was said to have been designed to protect and empower ethnic minorities. However, it has practically provided nothing for minorities and so has failed to change their situation. The regime in Ethiopia explicitly interferes with the rights of disadvantaged ethnic groups and has been a source of contention for decades. The country started to feel the tension since TPLF came to power in 1991. And this tension has got intensity over time, and caused the ongoing political turmoil. The TPLF exercises absolute control not only over the politics but also the economy. The party controls significant portions of the economy through its own companies and affiliate business institutions. It has exploited the country’s resources and built a business empire which makes billions of dollars of profit by further marginalizing other minority groups. According to Rene Lefort, a well-known observer, the public and para-public companies that are affiliated with TPLF control two-thirds of the country’s economy. On top of that, land-grabbing has become a fashion in recent times and has disappointed many ethnic groups whose livelihood relies heavily on their land. The regime not only steals land from these marginalized groups and gives it to its own affiliates and supporters, but also sells it to foreign companies. Authorities say these large scale land transfers are part of the development plan of the country. However, human right groups that oppose the practice argue that this not only violates the rights of minority groups but also destroys their livelihood. The Human Right Watch stated in its report that this large scale land transfer and subsequent displacement results only in poverty and hunger. The Oakland institute has reported that a land equivalent of an area nearly the size of France was forcefully taken from farmers and indigenous people and given to foreign investors for agricultural purposes in the past few years. According to these reports, thousands were displaced in the past few years to make way for the illegal transactions, and those who resisted the authorities were intimidated, arrested, tortured and killed. Many observers argue that the people of Ethiopia were left with no other option, but protest. They believe that unless the regime makes real and complete political reform which meet the need of Ethiopians who are currently so oppressed and marginalized, the protest wouldn’t stop.